There is a third prophecy that totally and utterly fails in the 587-centered chronology of Christendom and the apostates. Yes, Egypt was to become a “desolate waste” with “devastated cities”, and this would last for “forty years”. The desolation did not happen immediately after Ezekiel or Jeremiah made their prophecies. Some Jews did, in fact, flee to Egypt for safety. However, 16 years after the destruction of Jerusalem, Ezekiel announced that the time had come for Nebuchadnezzar to take Egypt. In “the twenty-seventh year... the word of Jehovah occurred to me, saying: “Son of man, Nebuchadrezzar himself, the king of Babylon, made his military force perform a great service against Tyre.” For this service, Jehovah rewards the King. When did this happen? From the Bible record we can only assume it happened shortly after Ezekiel said Nebuchadnezzar was given Egypt as compensation for his attack on Tyre. Interestingly, secular chronology agrees. An ancient clay tablet now residing in the British Museum, known as the Nebuchadnezzar Inscription, talks about Nebuchadnezzar's action against Egypt in his 37th year. That would be two years after Ezekiel said Egypt would be given to Babylon by Jehovah. 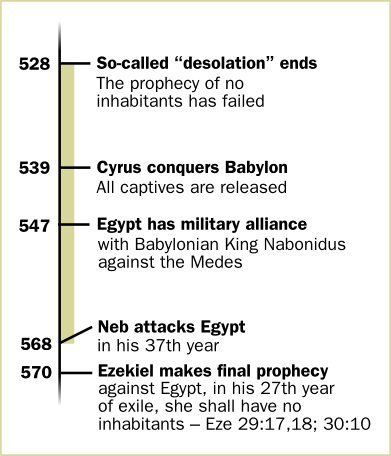 As you can see from our chart, in the 607-based chronology, Ezekiel makes his prophecy in 590 BCE, and Nebuchadnezzar's 37th year is two years later in 588 BCE when he attacks Egypt. We can assume the Nebuchadnezzar Inscription is correct on this point, because it agrees with our Biblical chronology. So Egypt's 40-year desolation begins in that year. Counting 40 years hence, we come to the year 548 BCE as the end of Egypt's desolation, when Jehovah would “bring back the captive group of the Egyptians” for them to become a “lowly kingdom”. Indeed, secular chronology also records that the last Babylonian King Nabonidus held an alliance against the Persians with Amasis II, the King of Egypt, in addition to the Lydian Empire. So far from being a competing world power, Egypt is now a “lowly Kingdom” just as the Bible said, resorting to military alliances with its previous opponent. We can see from the chart that the Bible chronology provided more than enough time for all of these events. Egypt has 40 full years of desolation, with more than enough time afterwards to be repatriated and to forge an alliance with Babylon as the secular records claim. However, as our other chart shows, the 587-based chronology of Egypt's desolation is a total mess. According to their chronology, the 27th year of Ezekiel's exile (when he made his final prophecy against Egypt) was in 570 BCE. Again, relying on the secular records, Egypt was attacked by Nebuchadnezzar in his 37th year, which is two years later, 568 BCE. All fine so far. But wait, just 21 years later the secular records say Egypt forged an alliance with Babylon! Worse still, the secular records say Cyrus conquers Babylon just another 8 years after that. The Bible says that Cyrus let all exiles go when he took power. Did he make an exception, that all exiles could leave and be repatriated except for Egyptians? The Bible doesn't mention anything of the sort. According to the secular chronology, any such desolation could have only lasted 21 years, perhaps 29 years if you toss out the secular evidence that Egypt forged an alliance with the last Babylonian King. So, there was no 40-year desolation of Egypt. If the 587-based chronology is to be believed, the extensive prophecies of Jeremiah and Ezekiel against Egypt failed miserably! On the other hand, if one accepts the Bible's internal chronology that 607 is the date of Jerusalem's destruction, the 40 years of Egypt's abandonment fits perfectly. With the 607 date, Egypt has more than enough time to become repatriated and be ruled over by a King, to have a military alliance with Babylon and Lydia, and be strong enough to retain its independence against Medo-Persian rule for 14 years (as secular chronology also states). What will you accept? The chronology of secular historians who mould the Bible to fit their chronology, making inspired prophecies fail? Or will you accept the complete and harmonious Biblical chronology, which gives us a time-line without contradictions, showing the total fulfillment of every prophecy Jehovah gave us? Will you judge the accuracy of secular chronology against the occasions where it agrees with the Bible, or will you only judge the Bible correct if the secular evidence happens to agree with it? 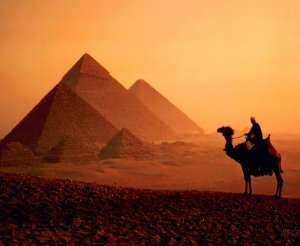 Egypt was to be desolated for 40 years. After repatriation, Egypt had an alliance with the last Babylonian King. Cyrus let all exiles and prisoners free. Only the 607-based chronology allows for this.